In Grimoire of a Kitchen Witch, Patterson discusses her life as a kitchen witch, ranging far and wide, touching on everything from auras to meditations to Sabbat rituals to recipes and spellcraft. 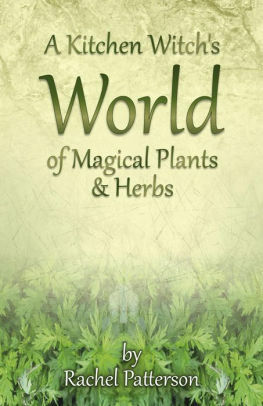 A Kitchen Witch’s World of Magical Plants and Herbs serve as a companion volume, of sorts, offering lengthy lists of correspondences and ritual/magical craft projects. Also known to the larger Pagan community as Tansy Firedragon, Patterson is the author of numerous books on magic, witchcraft, and ritual. 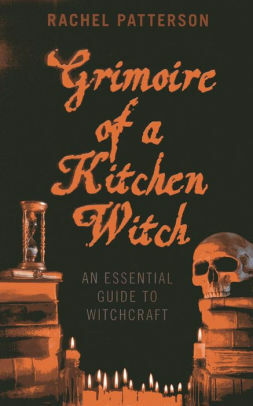 She is also the High Priestess of The Kitchen Witch Coven of Natural Witchery and a member of the Dorset Grove Druids. As such, she knows what she is writing about. To begin: the Grimoire. The book has no real structure; it is not organized around a central theme or thesis. Instead, it is organized more along the lines of stream of consciousness or stream of association. Her initial discussion of “What Is a Witch?” leads to short sections on “Sacred Space” and “My Kitchen”; in other words, where a witch does her work. The discussion of “Deity,” in turn, leads to sections on “Tools,” “Altars,” and “Cleansing and Consecrating;” in other words, the physical means of honoring and working with Deity, and how to do so appropriately. I initially found this organizational structure confusing — until I realized that any such organization was unnecessary. Information is very easy to find in the book thanks to the table of contents and the “Witchy Words” (glossary) at the end. Additionally, the sections are very short; bite-sized, even. Patterson’s Grimoire is not a dense read, and it is not meant to be. This is an introduction, a how-to, of sorts. This is Patterson laying out her beliefs and practices as a kitchen witch, and offering a roadmap to those who would like to do something similar and chart their own path. A Kitchen Witch’s World of Magical Plants and Herbs is the perfect companion volume to the Grimoire, though I have no idea if Patterson intended that or not. I am one of those geeks who loves dictionaries and encyclopedias; as such, I have a small personal library of books of correspondences, and I love to randomly flip through them in search of neat and unexpected associations. And Kitchen Witch does offer lengthy lists of correspondences, by intent, element, gender, planet, sign, and sabbat, to name just a few. There are also Deity lists, a chart of the Victorian flower language, herb code names, flowers by month, and much more. Even better, there is a specific section on crafts, as well as craft suggestions in the main list. These crafts run the gamut from the practical (carpet freshener) to the ritualistic (flower divination). The “Plant and Herb List” comprises the bulk of the text, and it is packed with information. For example, the entry on agrimony includes the plant’s scientific name, suggestions for its use, a spell to break a hex, a tea recipe, and its magical properties. Similarly, the section on cardamom includes a bath blend and an incense blend. Both titles are recommended to anyone with an interest in hearth/kitchen witchery, or plant/herb craft, as well as fans of Plant Magic by Kynes and The Hearth Witch’s Compendium by Franklin. They work especially well when used together, although A Kitchen Witch’s World of Magical Plants and Herbs can be used as a stand-alone resource.